We are very pleased to be listing "Al Shaheen". 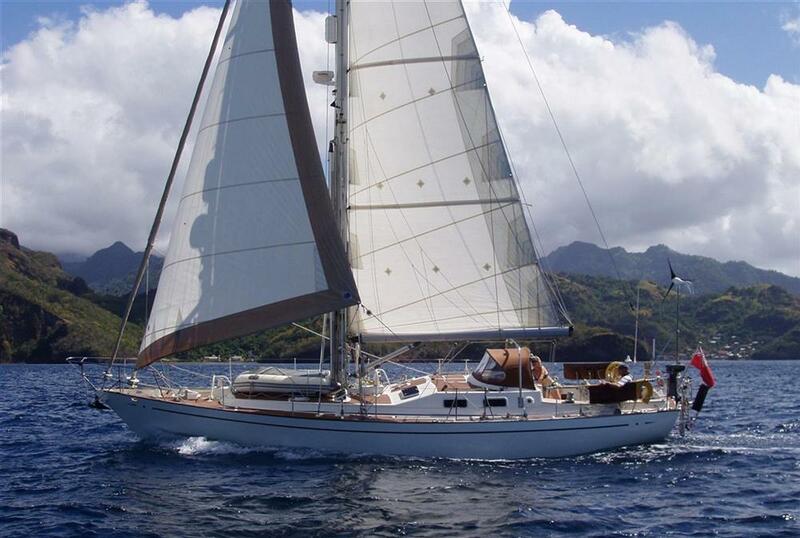 Known to us over a number of years through our membership of the Ocean Cruising Club she was designed by the renowned Naval Architect and former Ocean Cruising Club Commodore Mike Pocock. 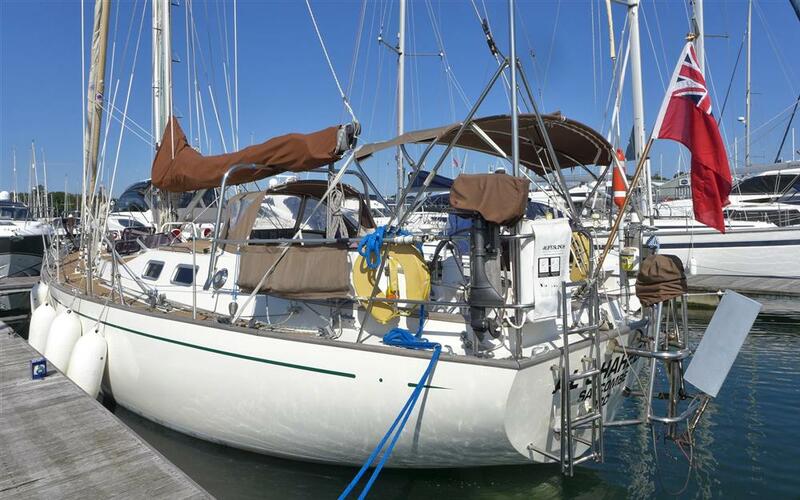 Built in Aluminium Marine Alloy to the exacting standards of her highly experienced owner (also a past Commodore of the OCC) and overseen in build by Surveyor Jim Pritchard, the result is a handsome, custom ocean passage maker with an impeccable pedigree, yet she is easily sailed by just two or single handed. 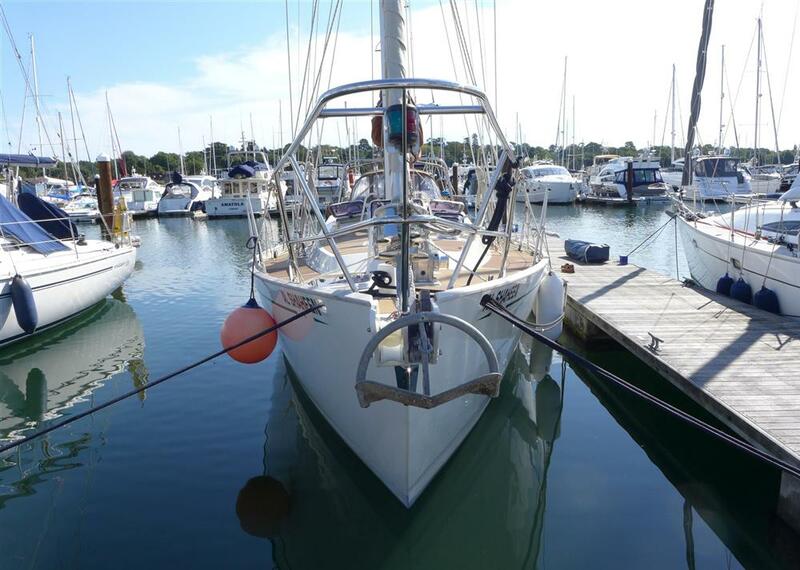 Launched in 2001 and now recently re-painted in 2014 by Fox's of Ipswich in Awlgrip, she is extremely well set up for long distance ocean sailing. 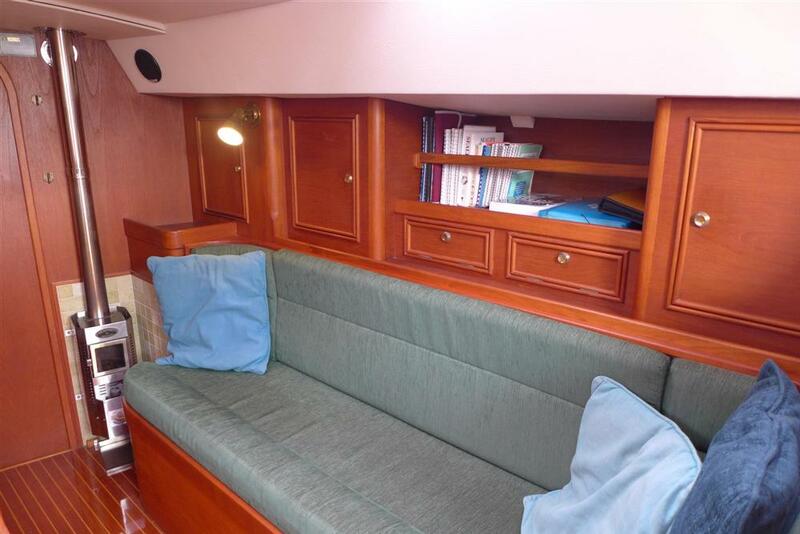 Designed for comfortable long term liveaboard cruising for a couple (with occasional guests) she is quite possibly the perfect blue water cruising yacht. Point her in any direction on the globe and she will eat up mile after mile, after mile. 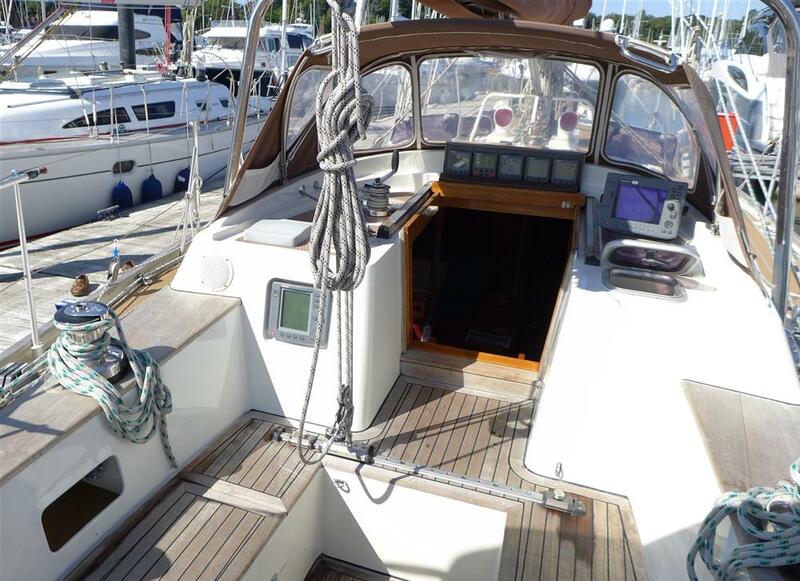 A highly regarded yacht, Al Shaheen is British Part 1 Registered, RCD Compliant and VAT Paid. AL SHAHEEN is a custom-designed sailing boat, strongly constructed in marine grade aluminium alloy, designed for ocean cruising, and laid out for long distance cruising for a couple, in comfort. 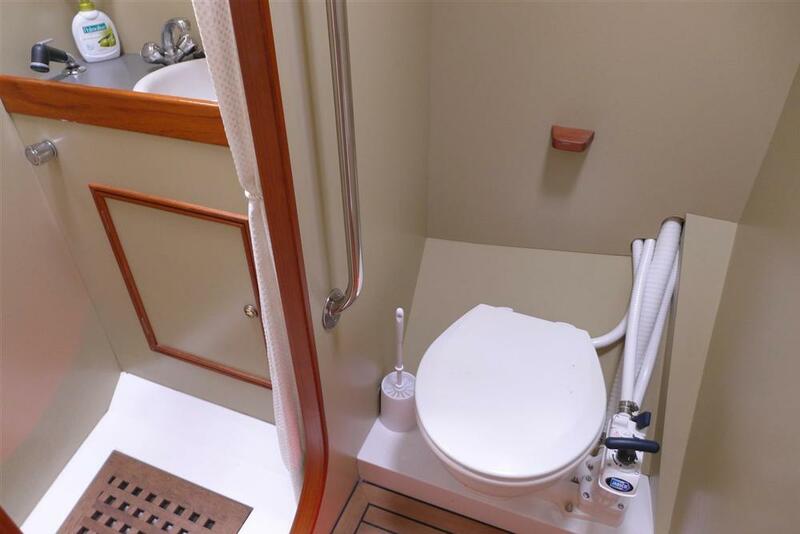 The designer, Michael Pocock as well as being an accomplished naval architect, is an extremely experienced cruising yachtsman and the design of this vessel incorporates many features of his extensive practical cruising experience. Easily managed single-handed. 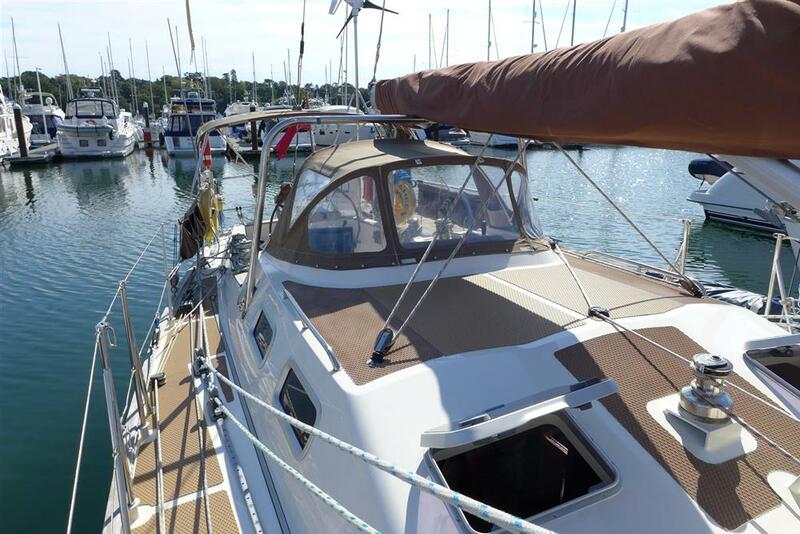 The vessel was conceived by the Owner based on the success of two of Michael Pocock’s earlier designs Troubadour and Brown Bear, both 45 footers and both constructed in cedar/epoxy composite. At the Owner’s request, these lines were scaled down to 42 ft and the design was adapted for aluminium construction. 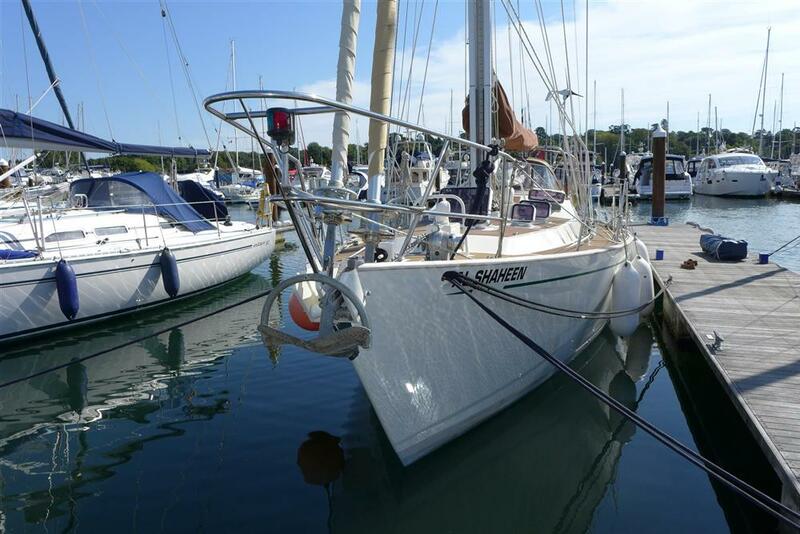 Al Shaheen thus became the first of a series of three 42 footers, Al Shaheen (alloy), Sadko (alloy) and Arabesque (cedar/epoxy composite) all for very experienced members of the Royal Cruising Club and/or the Ocean Cruising Club, as were the original 45 footers. Sadko has cruised in Greenland and Antarctica. Fabrication of the hull, deck and superstructure was undertaken by Cunningham Offshore Racing in Littlehampton, UK and completed in July 2000. 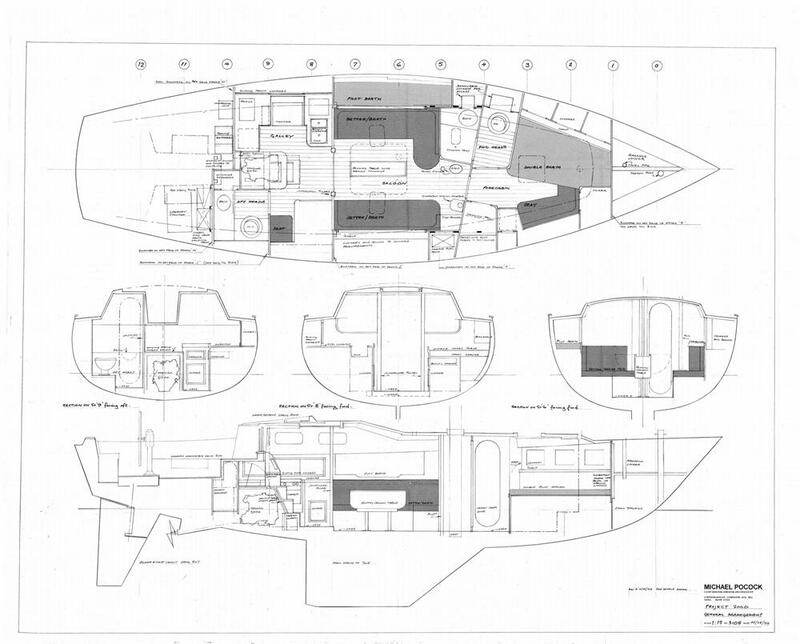 The hull was then transferred to the River Hamble where she was completed by David Skene of Skene Services. She was launched in May 2001. The complete build project was supervised by the Owner as Project Manager and he also undertook all the procurement of materials, equipment and services. The specification of the rig, sail plan, deck layout, deck fittings and running rigging was all by Michael Pocock. Most other items of equipment were selected or specified by the Owner and all systems were designed by the Owner, a Chartered Engineer. The basic design theme throughout was sound engineering, simplicity, functionality and reliability. 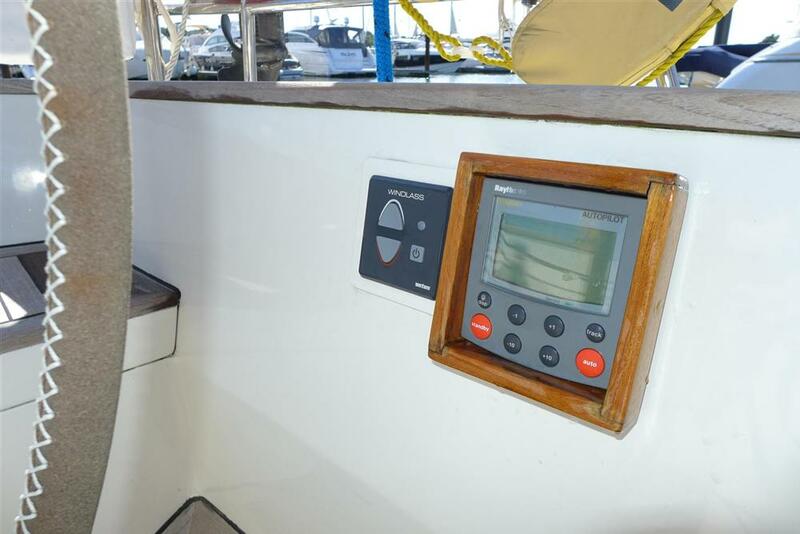 The metal fabrication contract was carried out under the supervision, inspection and certification of Marine Surveyor Jim Pritchard. The Owner obtained certification as Builder for type (Pocock 42) compliance with the European Recreational Craft Directive 94/25 EC and Al Shaheen has certification of compliance for Category A, unlimited. 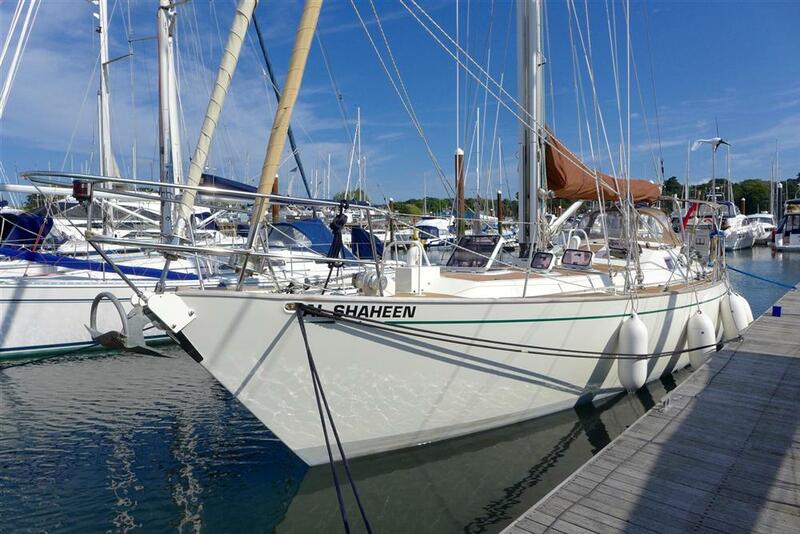 Al Shaheen has cruised extensively in the UK, France, Ireland, Spain, Portugal, Canaries, West Indies, Bahamas, East Coast of the USA, Nova Scotia, Newfoundland, the Azores and the Baltic countries, covering around 35,000 miles. 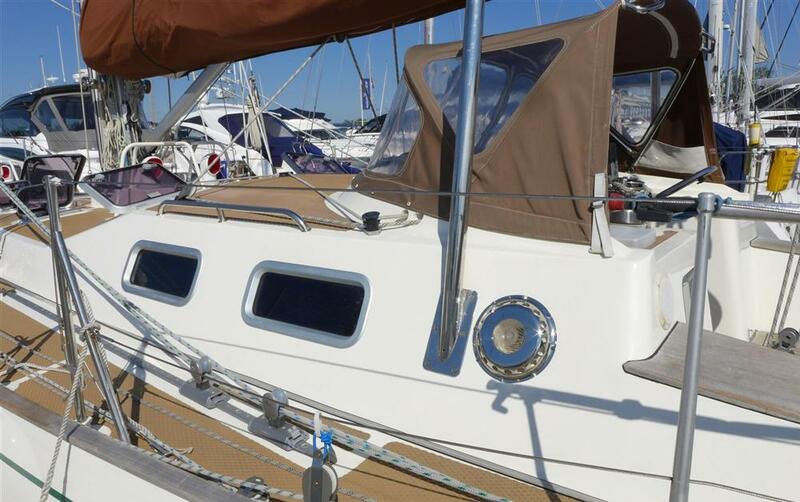 She has been maintained throughout to a very high standard and was completely repainted in 2014 by Fox’s of Ipswich in Awlgrip. 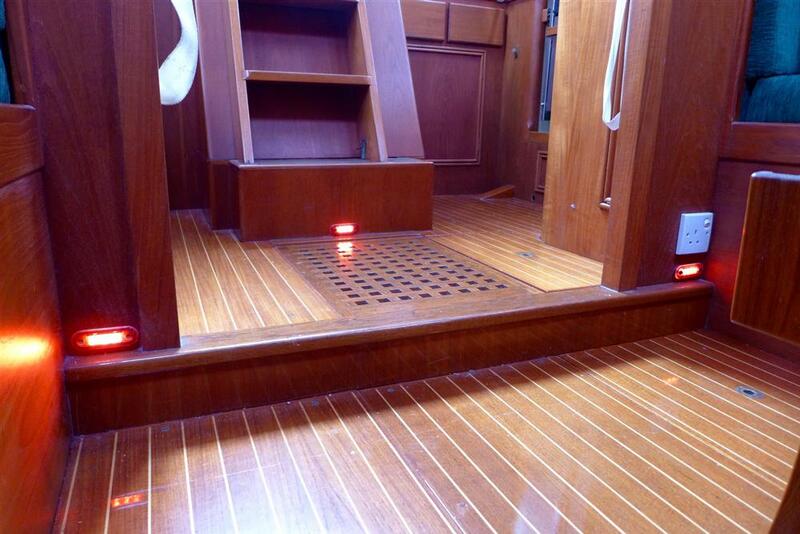 •	Plating thickness throughout is 6 mm, except 300 mm garboard strake in 8 mm and all keel plating 10 mm. 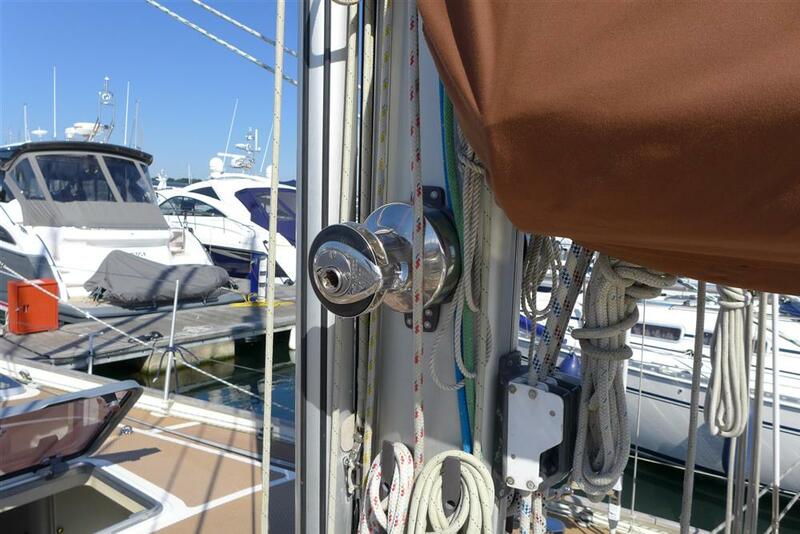 Inserts of 10 mm plate in deck around chain plates and windlass. •	Rudder (semi-balanced) fabricated from 6 mm plate and mounted on short alloy skeg. Rudder stock 75 mm solid bar with footstep bearing on skeg. Delrin lower and upper bearings. All rudder bearings replaced 2016. •	Propeller shaft fully shrouded within alloy tunnel welded to hull plating. 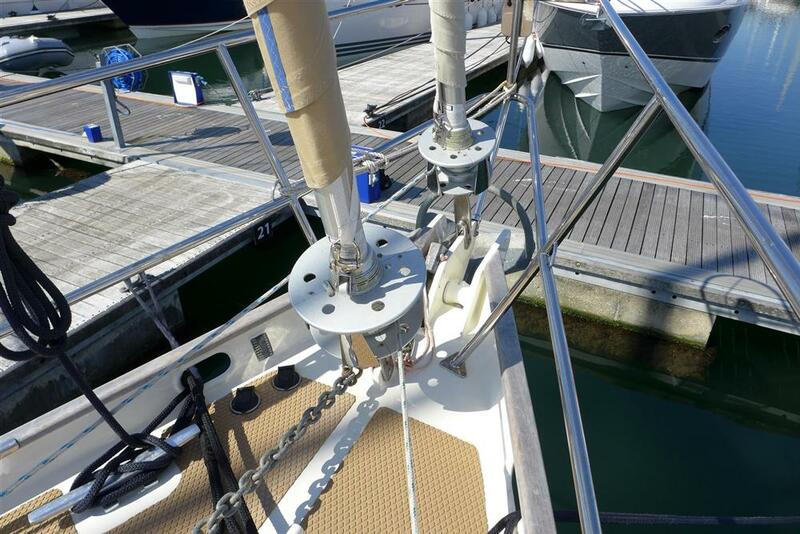 •	Sampson post forward of 100 mm tube extending to the hull, welded to deck and to Frame ‘A’. •	Deck drains (2 each side) fabricated from 1.5”/ 38 mm I.D. alloy tube and annealed after bending. 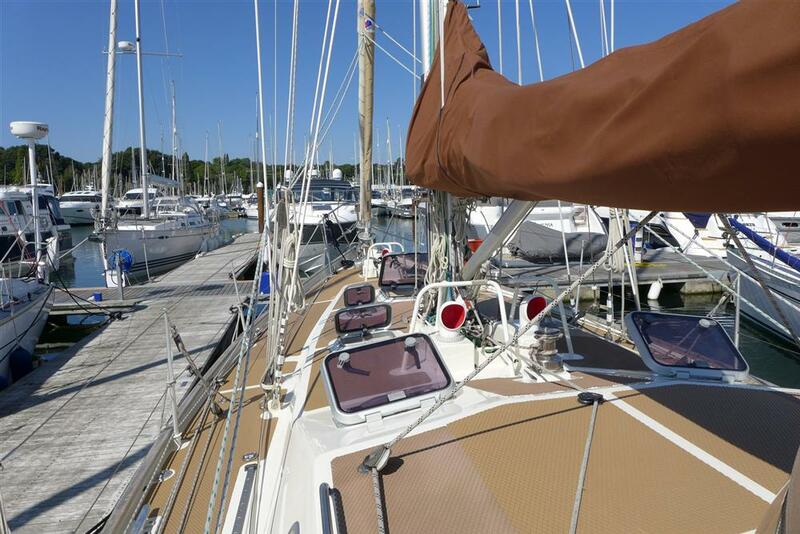 Run internally from deck to waterline. 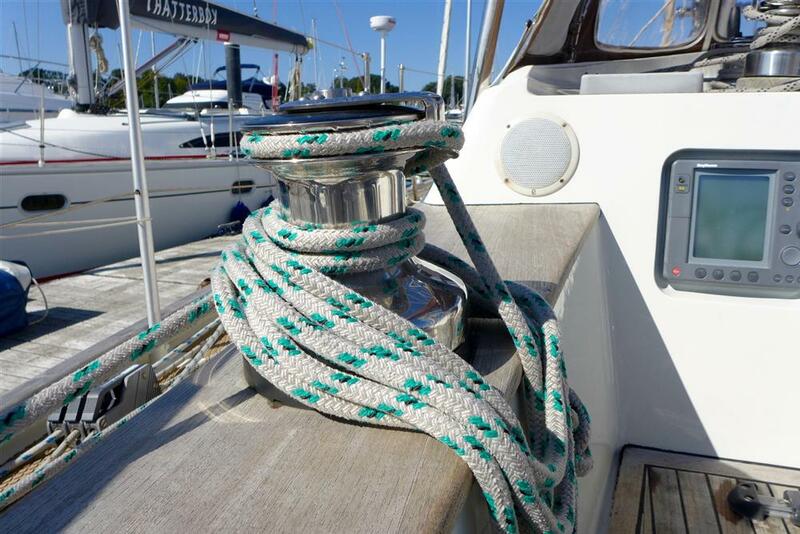 •	Stubs for seacocks in alloy tube welded to hull plating and threaded at upper end to accept seacocks. 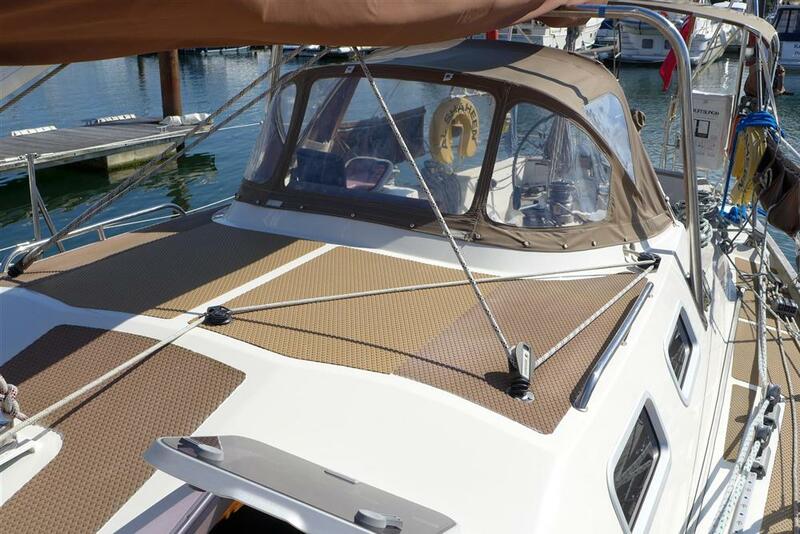 •	Hull above waterline, deck and superstructure painted (re-painted 2014) to Awlgrip specification in Oyster White. 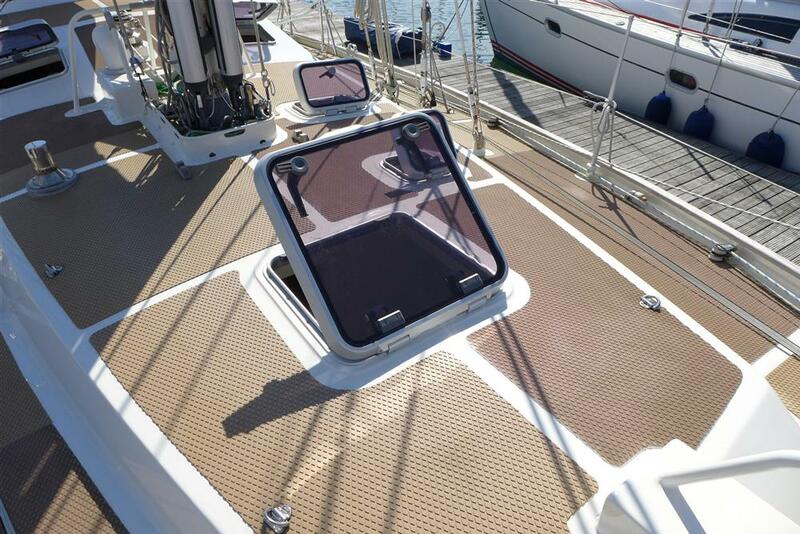 Below waterline to Awlgrip epoxy specification. 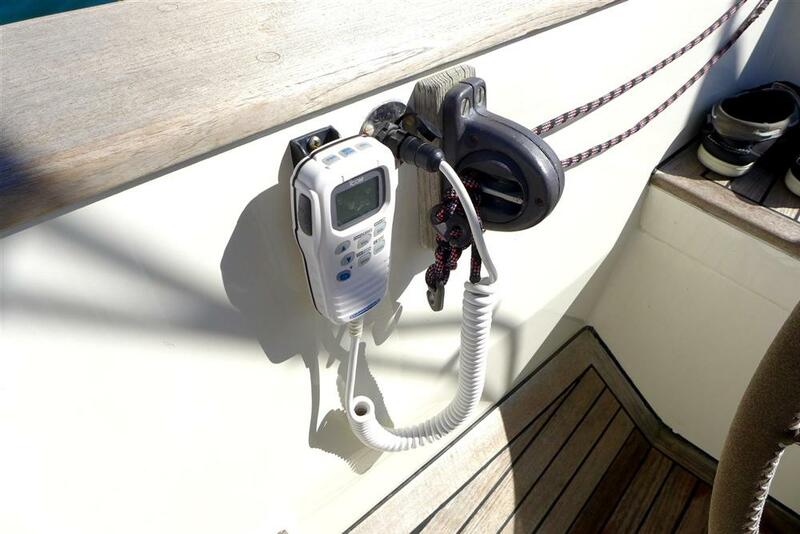 •	Anti-fouling is ePaints SN 1 in grey colour containing no metal elements and compatible with aluminium. It is also very effective. 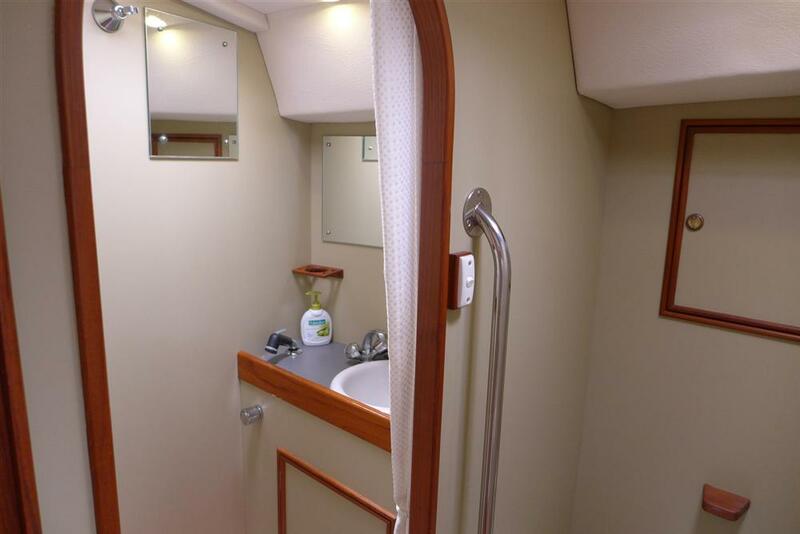 •	The bare hull after fabrication, and before fit-out, was sprayed internally with 40 to 45 mm flame retardant polyurethane insulation from deckhead to the waterline within the whole accommodation area. 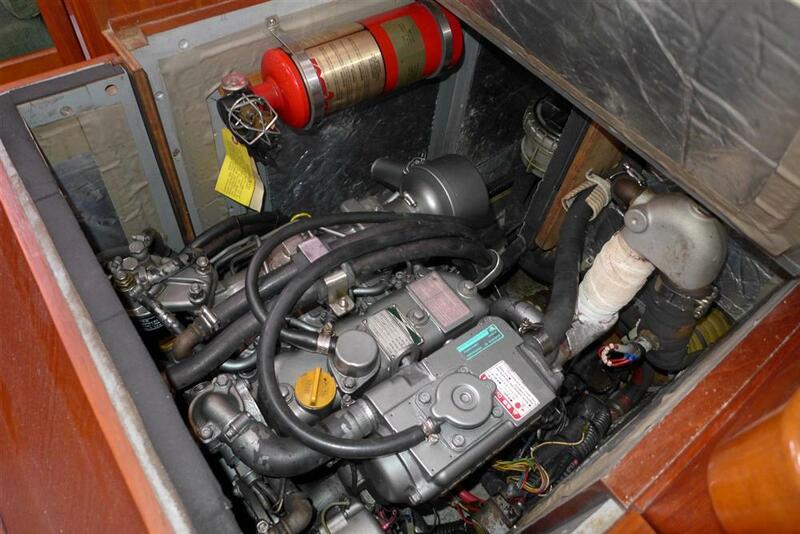 •	Diesel main tank integral in keel of 300 litres capacity. Alloy deck filler. 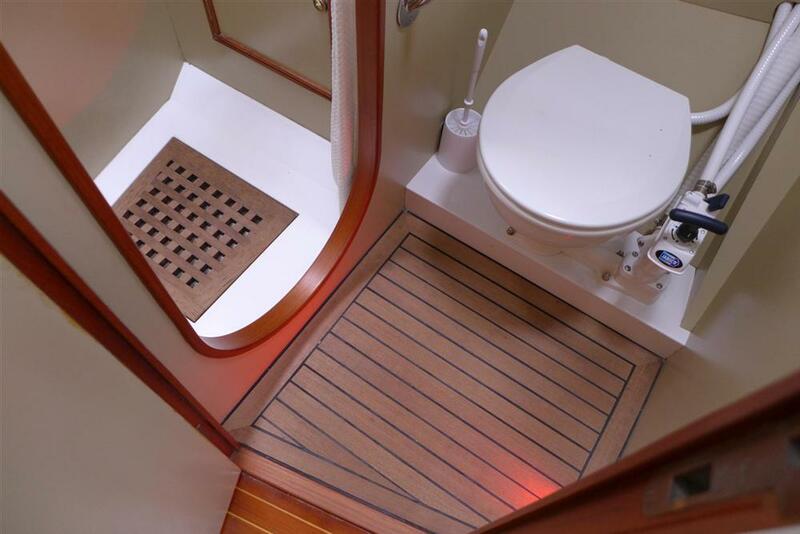 •	Isotherm Slimline 25 litre stainless steel water heater mounted under cockpit sole, heated by engine cooling water or 230 volt electric element. Fitted with thermostatic mixer valve. Space available for 45 litre unit. 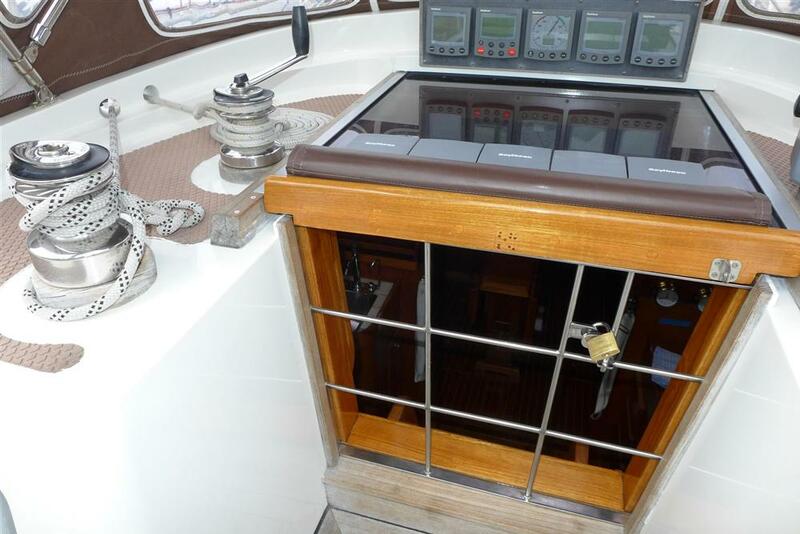 •	Gas cylinder storage locker aft under helmsman’s seat. Self draining and vented to transom outlets. 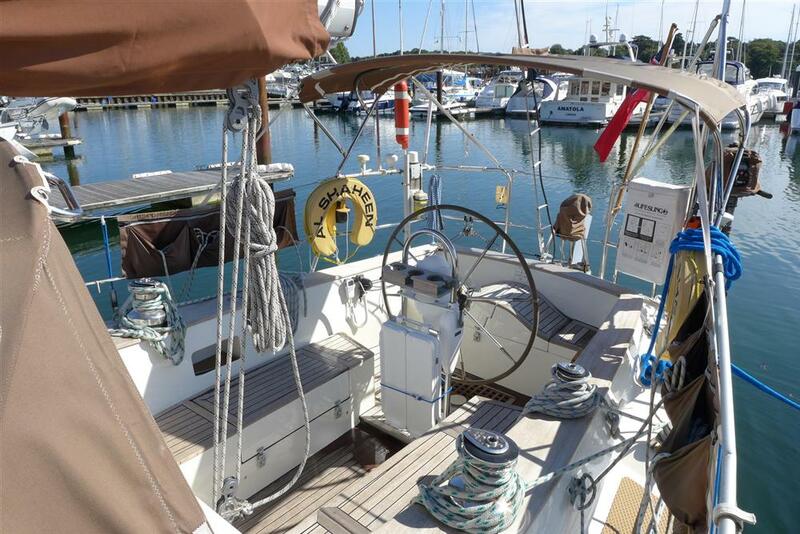 Fitted with 3 x US type aluminium 10 lb propane cylinders, 2-position regulator, 12 volt solenoid operated valve and copper piping to galley stove. Cabin is painted off-white in satin finish. 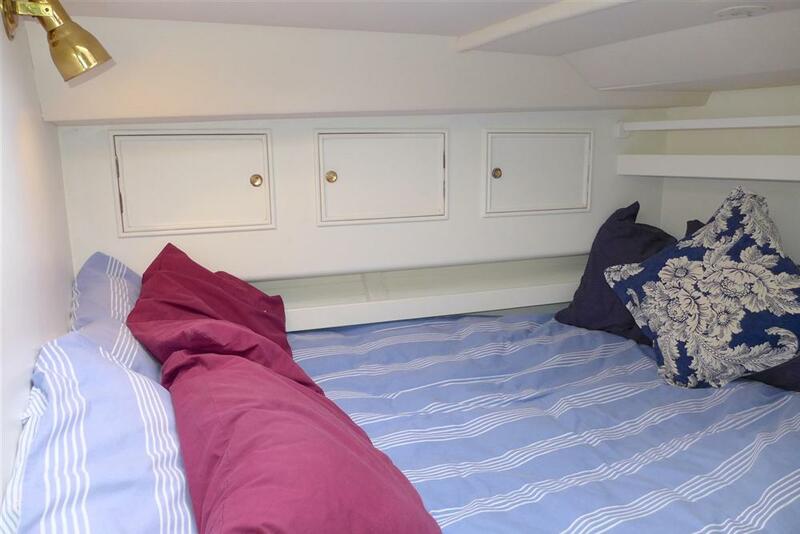 Double bunk to port with extensive stowage under and shelf outboard. Three lockers outboard under deckhead. 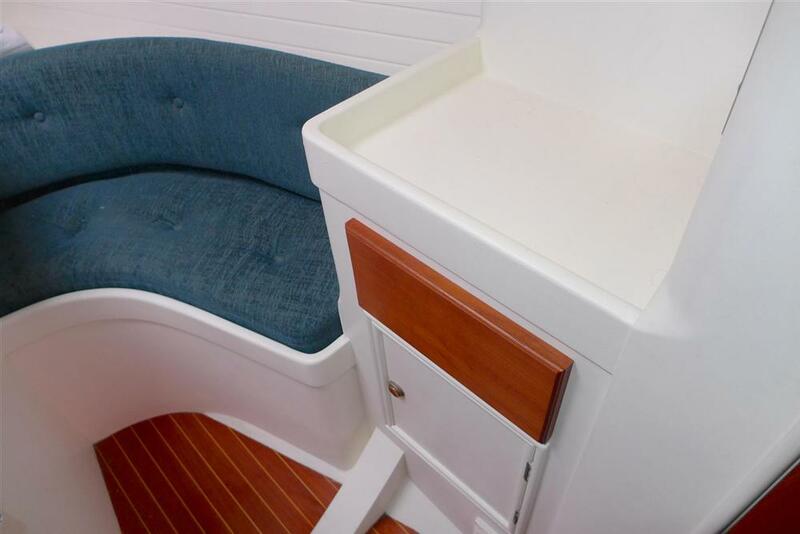 Curved seat to stbd with stowage under and behind; small dresser with lockers under. 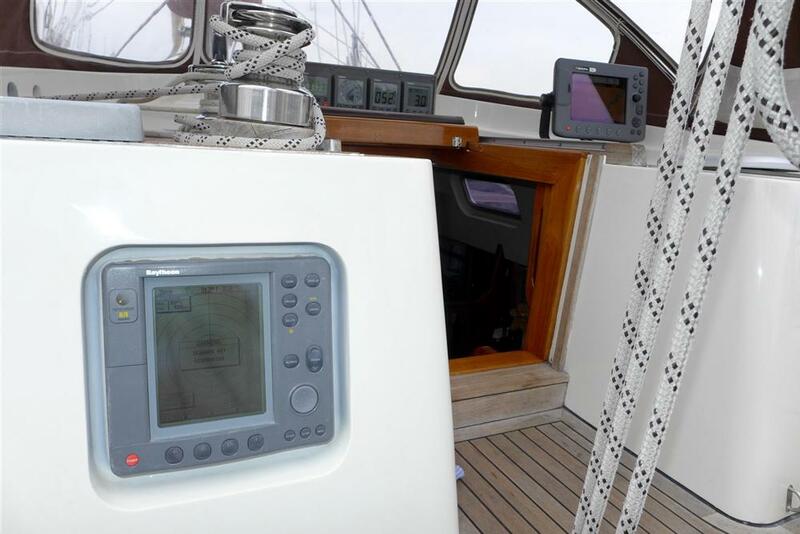 Lewmar Ocean 60 hatch to deck. Hanging locker with teak louvre door to stbd with shelving outboard.. Door to heads compartment. Jabsco heads (large bowl) with manual pumping. Storage lockers outboard of heads. Separate shower compartment leads off from heads. Vanity unit with white ceramic bowl, H&C mixer tap. Shower head with 2 m flexible tube and mixer valve. Shower tray in white GRP with teak grating and draining to grey water tank. Storage lockers in vanity unit and outboard of counter top. Counter top in grey Formica. Door to main saloon with full-length mirror on back of door. 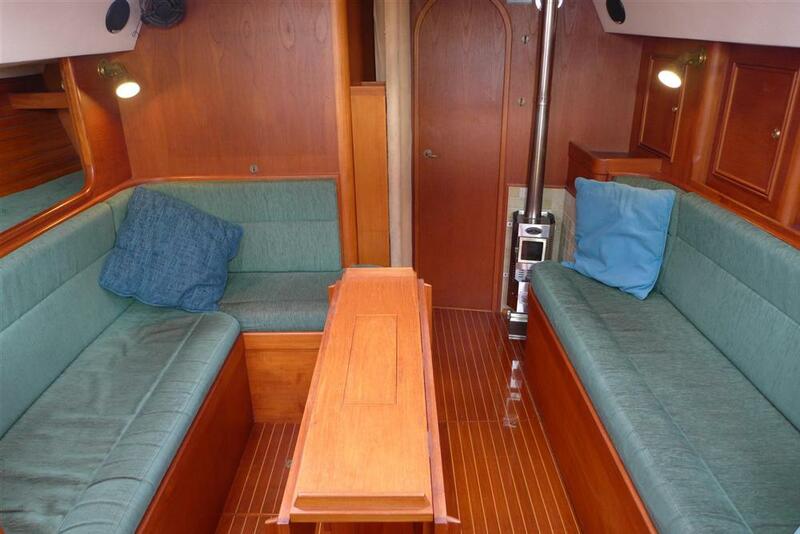 Cabin is “open plan” including galley and navigation area, all in teak and with matt varnish finish throughout. 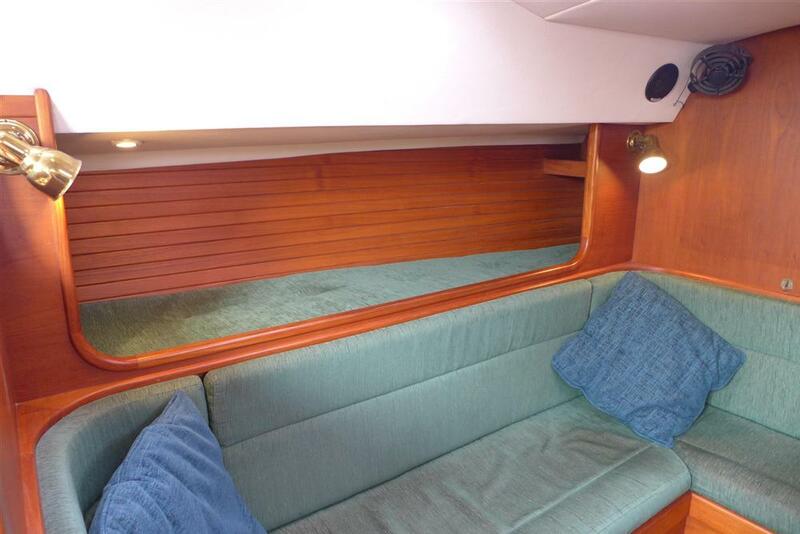 There is a half-level dividing bulkhead between the saloon and the galley and navigation areas with vertical teak posts. Keel stepped mast at forward end. 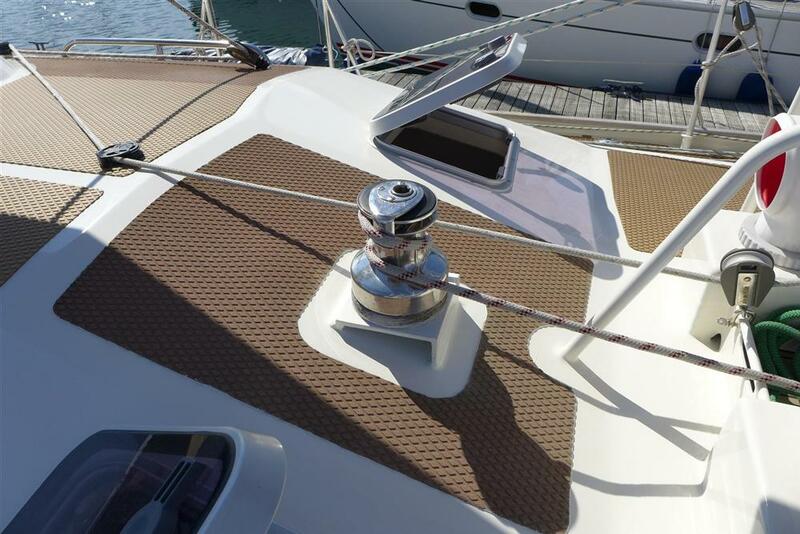 Mast covered in detachable Alcantara suede panel in light brown. 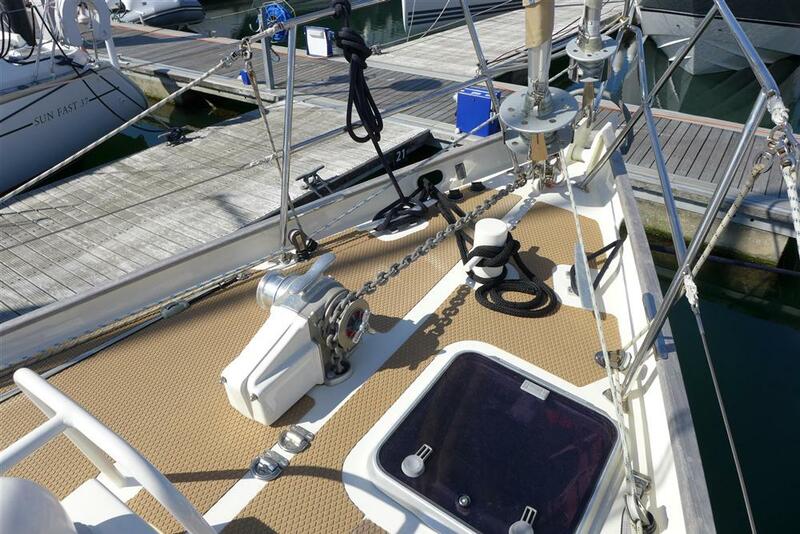 Tubular alloy strut aft of mast also covered in same material with Velcro fasteners. Slimline teak bookcase between mast and strut. 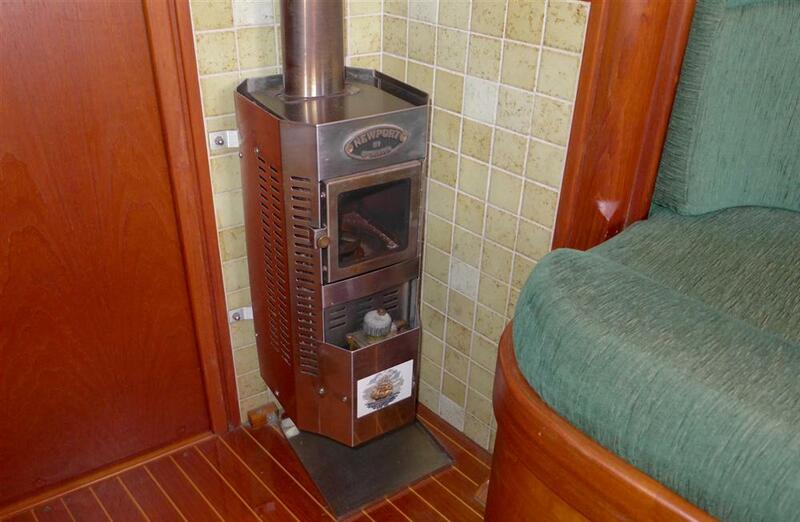 Dickinson Newport diesel heater to starboard with exposed stainless steel chimney and tiled surround. Drinks locker outboard of stove. 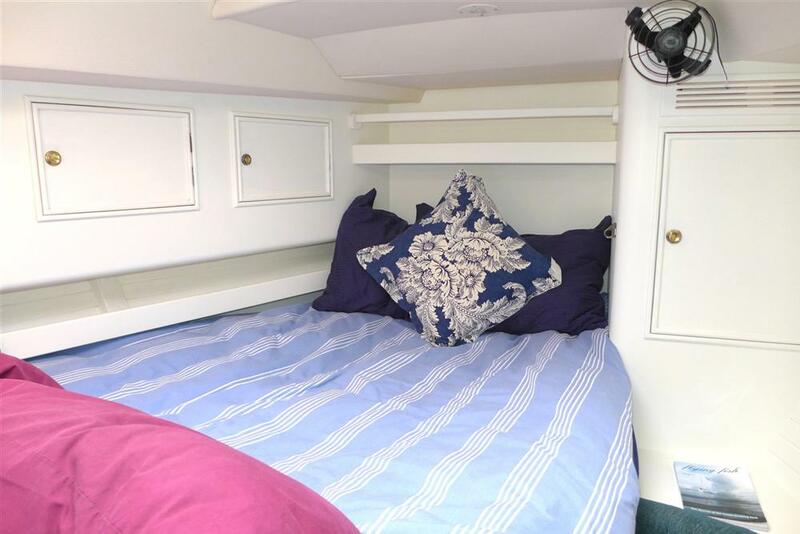 Settee berth to starboard (6’6”) with storage behind berth back cushion and under seat cushion. 3 storage lockers and bookcase outboard, all in teak. 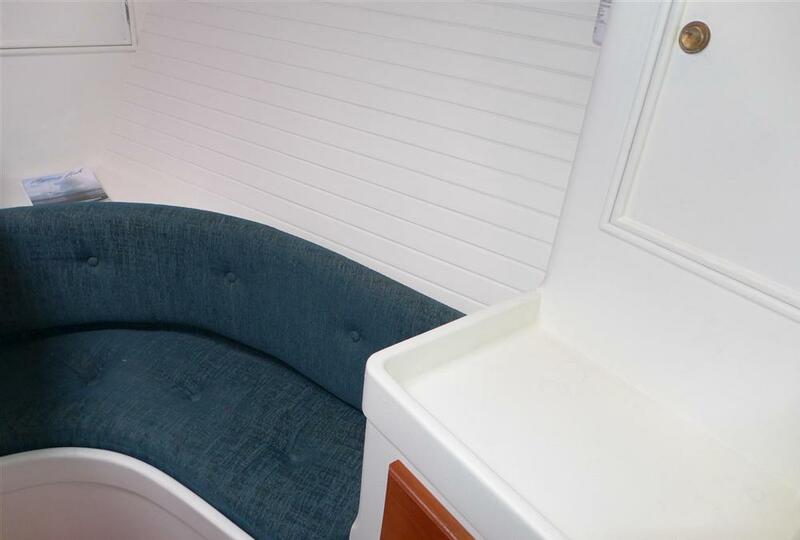 ‘L’ shaped settee berth to port with storage under and behind seat back cushion. 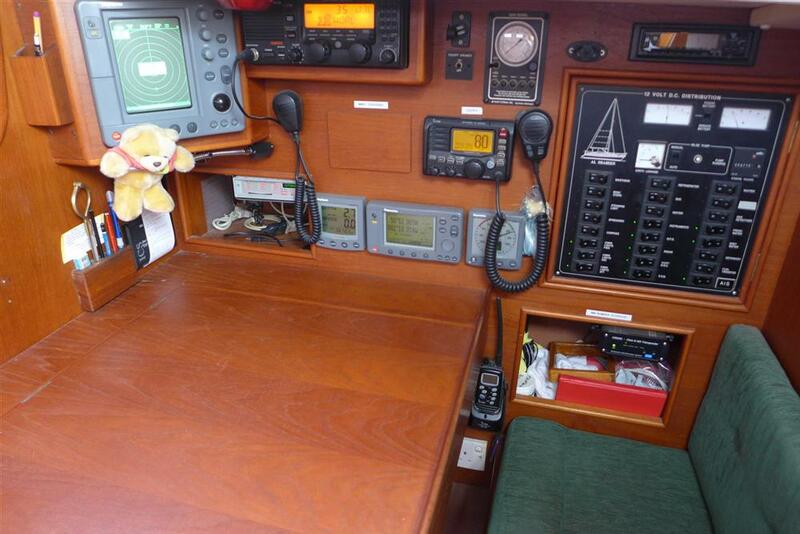 Pilot berth above and outboard of settee berth. 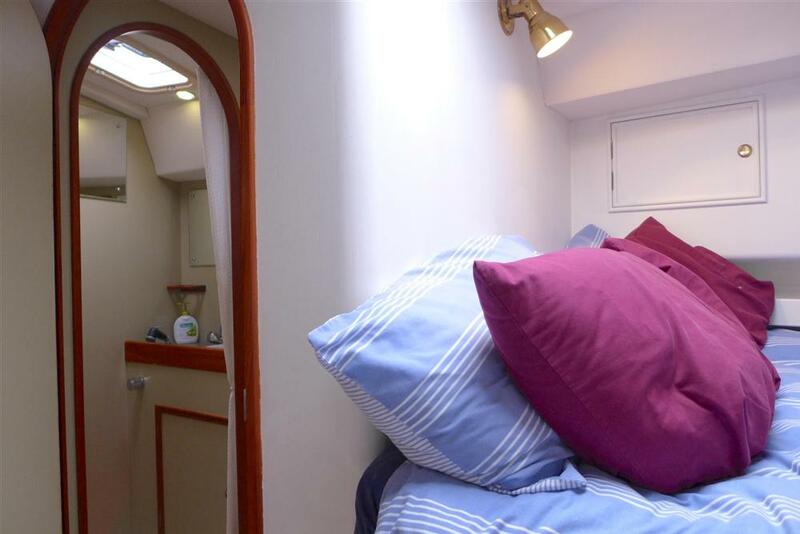 Shallow storage lockers under pilot berth cushion (small spares storage). 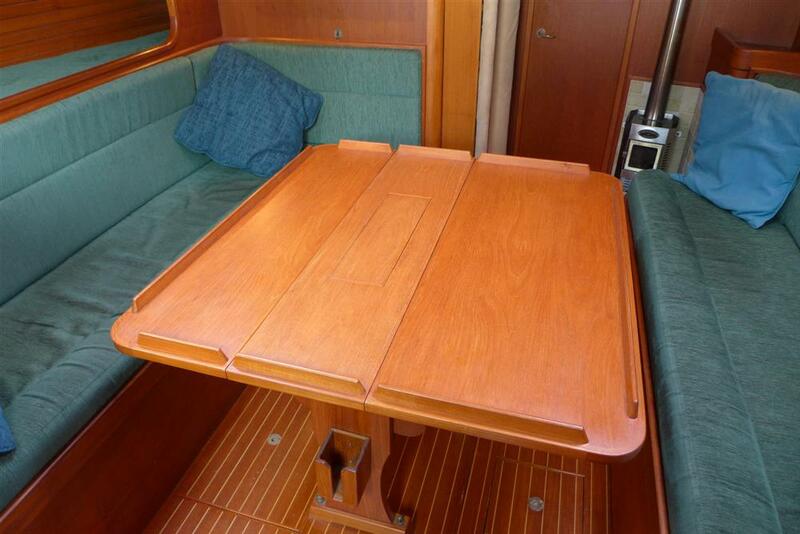 Teak table on centreline with two folding leaves. Bottle storage in table centre section. 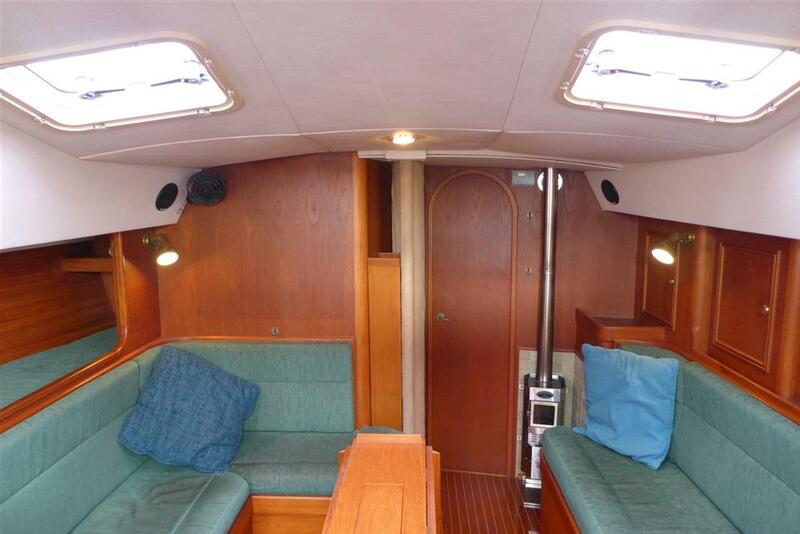 Extensive storage space for drinks containers below cabin sole on top of alloy plating. 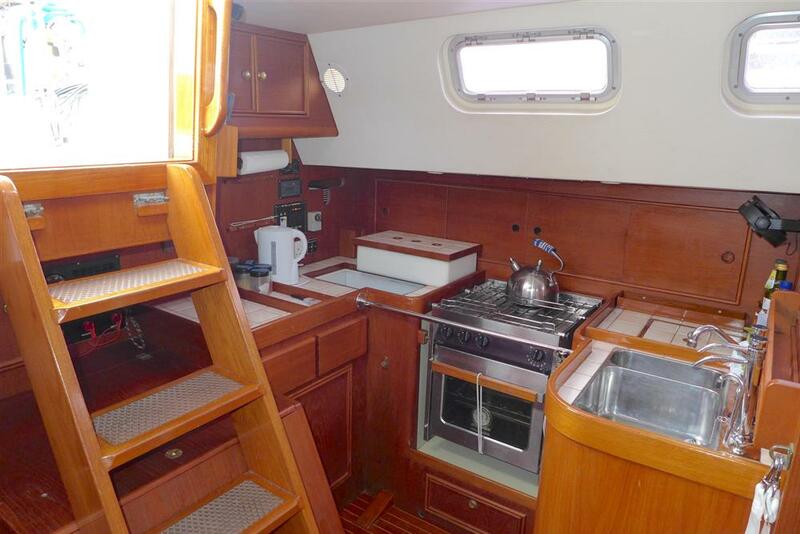 Galley layout is ‘U’ shaped with sink along forward side, stove on outboard side and chest fridge on aft side. Work surfaces covered in 3” ceramic tiles. Lockers under sink and other sides. Lockers with sliding doors above work surface on port side. Spice rack. 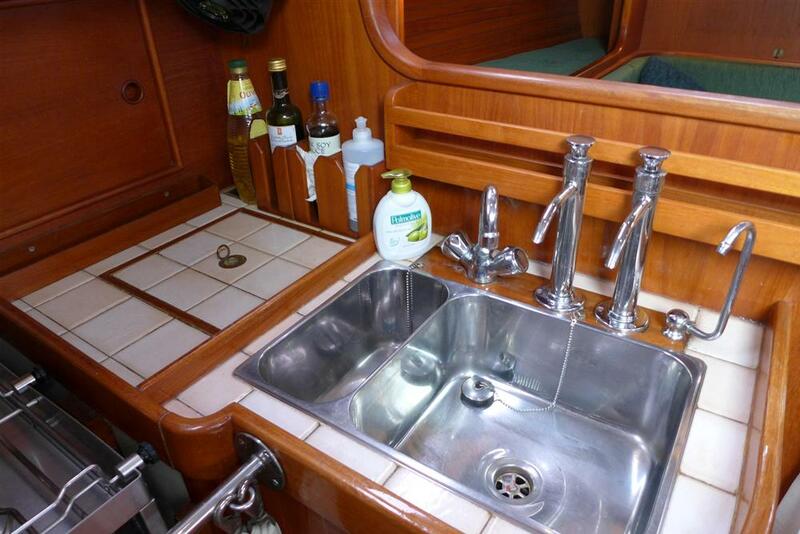 1 and a half bowl stainless steel sink with H&C mixer taps and manual pumps for seawater and filtered fresh water. Force 10 3-burner gimballed stove with oven. Safety strap for cook. Very large chart table with chart storage under. 3 drawer unit under table and pockets for A4 size folders etc. 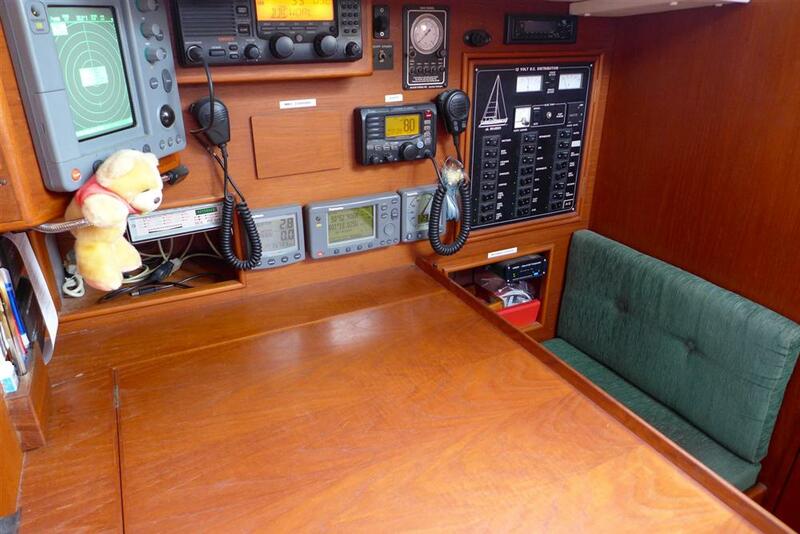 Upholstered navigator’s seat with tool storage under. 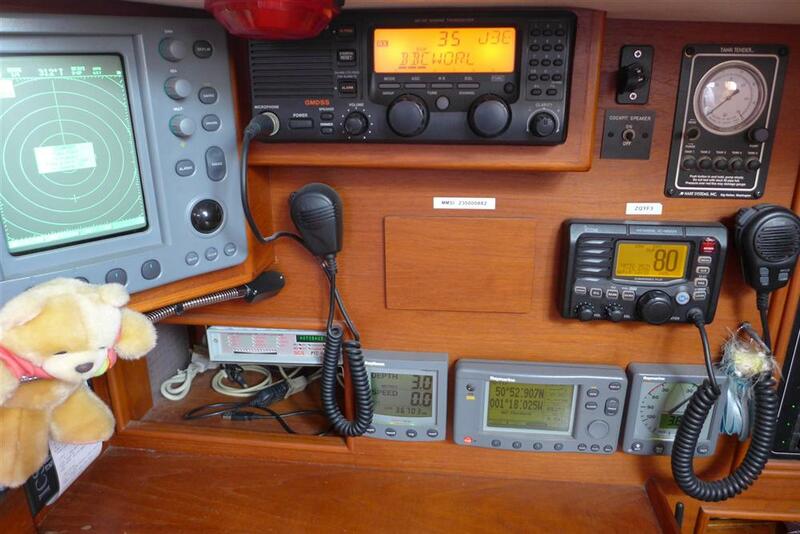 Instruments, 12 volt distribution panel and radios outboard of chart table. Safety strap for navigator if standing. 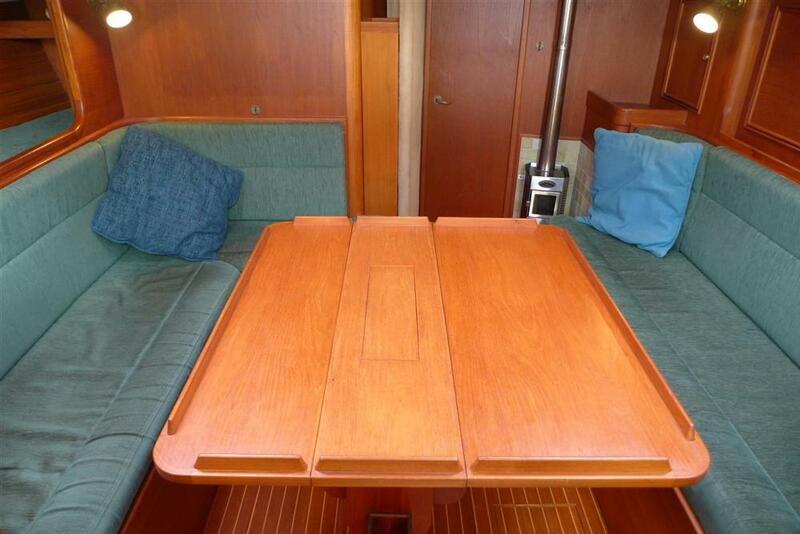 The aft heads is situated to starboard of the engine compartment and aft of the chart table. Teak entrance door. Jabsco manual heads. White ceramic bowl with H&C mixer tap in small vanity unit. Bowl drains to grey water tank. 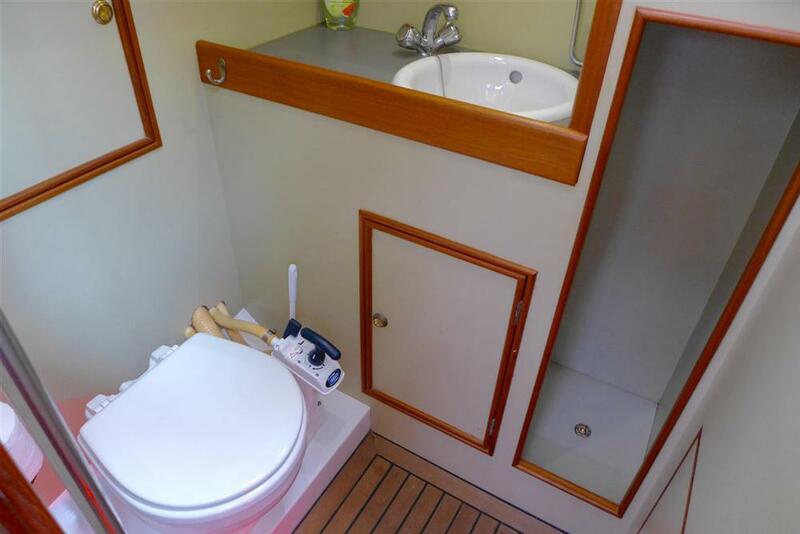 Storage lockers outboard and under basin. 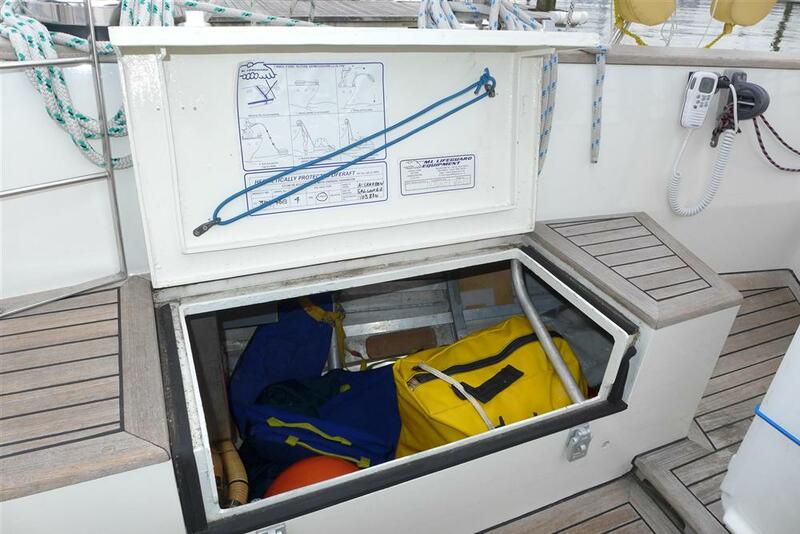 Foul weather gear hanging compartment. Access hatch to engine compartment. •	Force 10 stainless steel gimballed 3-burner gas stove with oven and broiler. 4 s/s fiddles. •	Chest type top-opening fridge with thermostatic control. Frigomatic W35F sea water cooled fridge compressor located in port cockpit locker. •	Dickinson Newport diesel fired cabin heater with stainless steel chimney and deck cowl. 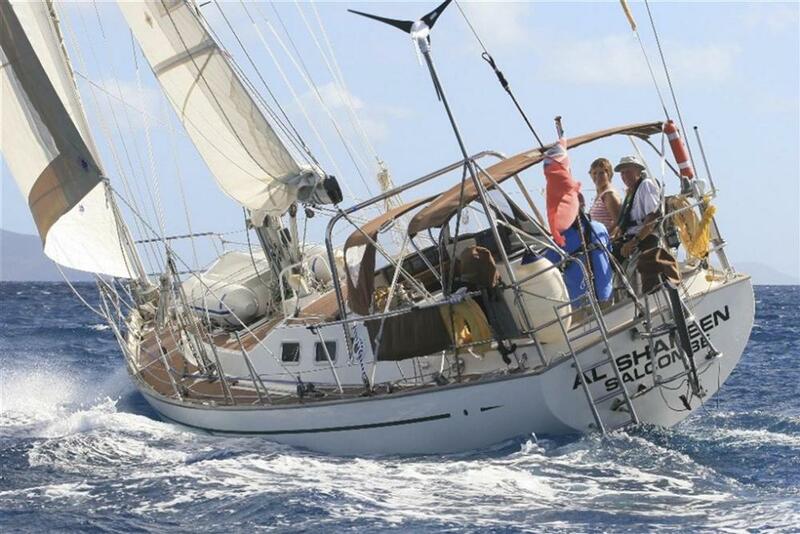 •	Al Shaheen is rigged as a Bermudian sloop with two “close-coupled” headsails; an outer genoa and an inner working jib. 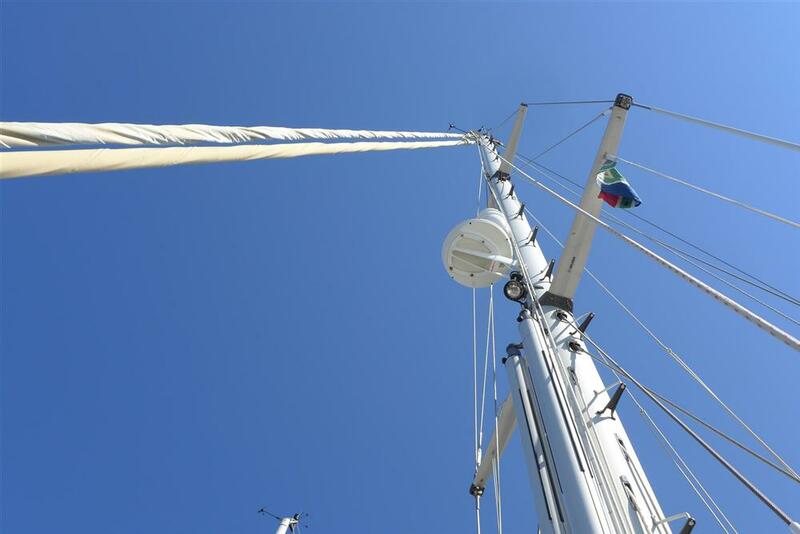 The headsails are not set together as in a cutter and are only set together when poled out one on either side when sailing downwind. 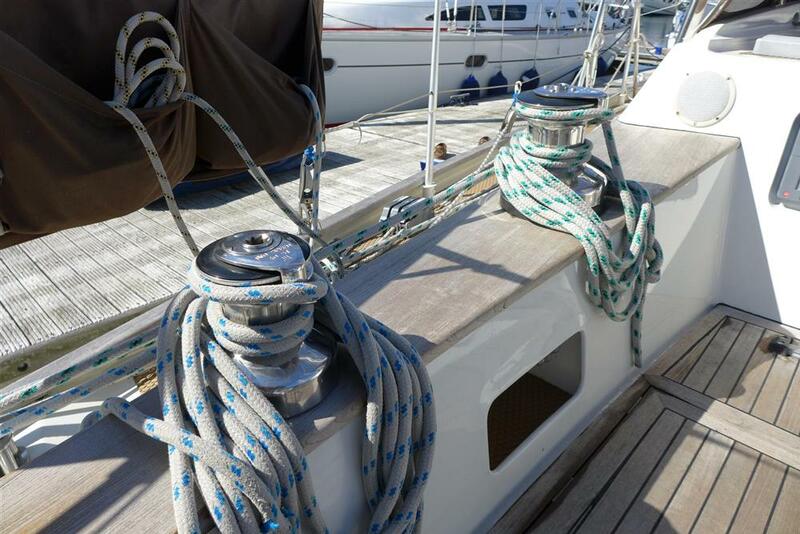 •	Selden alloy spars with keel-stepped mast. 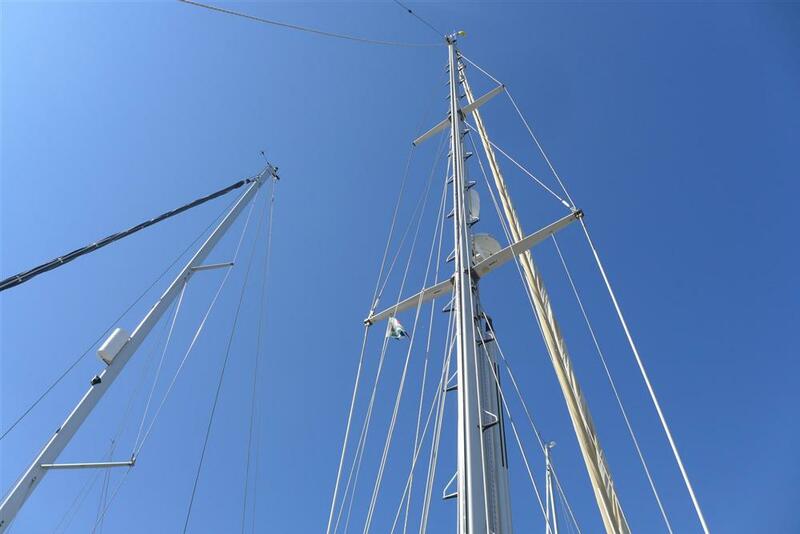 •	Twin Selden alloy spinnaker poles stowed on the mast and very easily deployed single-handed. After guy and fore guy permanently rigged. •	Storm jib by Sanders Sails. 2001 but hardly used. •	7 Lewmar Ocean hatches and 4 Lewmar portlights, 2 opening. 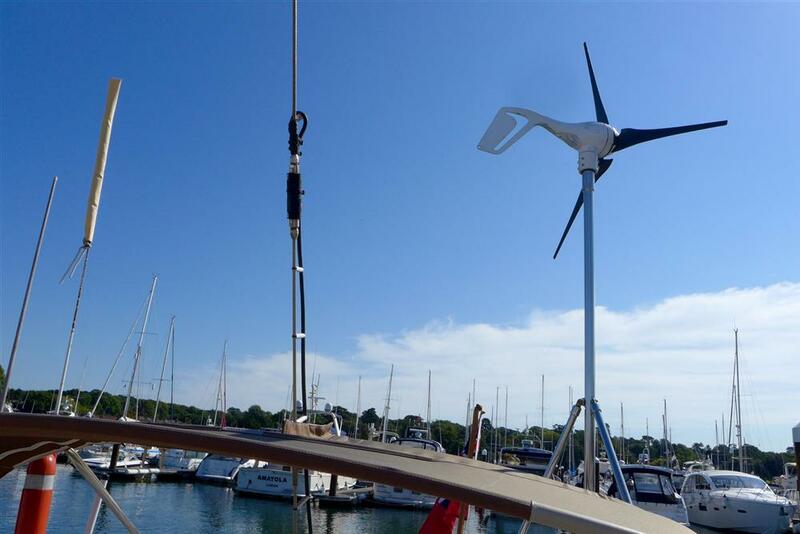 •	Spare Airex blades, spare impeller for Aquair towed generator.